Glenfiddich has announced a charity auction of one of its rarest ever whiskies, the Glenfiddich Janet Sheed Roberts Reserve, in aid of Walking With The Wounded. 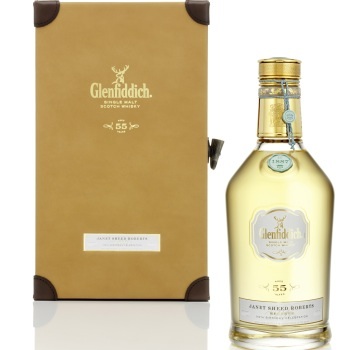 The 55-year-old single malt Scotch whisky honours Janet Sheed Roberts, the granddaughter of William Grant – founder of the Glenfiddich distillery – who celebrated her 110th birthday in August 2011 and is the oldest living person in Scotland. Only 11 bottles of the Glenfiddich Janet Sheed Roberts Reserve will ever be released to the public, one to celebrate each decade of her life. The charity auction will take place at 6.30pm on Friday 10 February at The Honourable Artillery Company in London, and will be led by senior Christie’s auctioneer James Bruce-Gardyne. It will be bottle No.2 that is released to the public during the auction – each bottle is hand-numbered and bottle No.1 sold at Bonham’s in December last year for £46,850, breaking a world record for the most expensive single malt Scotch whisky sold at auction. All proceeds from the sale of the whisky will go to Walking With The Wounded, a charity dedicated to the re-training and re-education of UK servicemen and women. Glenfiddich is the main sponsor of the charity’s expedition to Everest this April – a fundraising challenge to put five wounded servicemen on top of the world – and guests will have the chance to meet members of the expedition’s summit team. The event will be hosted by Peter Gordon, Glenfiddich chairman, and Brian Kinsman, Glenfiddich malt master and the creator of the Janet Sheed Roberts Reserve. Guest speakers from Walking With the Wounded will include Edward Parker, co-founder of the charity and Private Jaco van Gass who is part of the Everest summit team. Van Gass also took part in the Walking With The Wounded expedition to the North Pole last year, which was joined by the charity’s patron, Prince Harry. Entrance to the auction is by invitation only and anyone who is interested in bidding for the Janet Sheed Roberts Reserve, either in person or on the phone, should apply for their place by email at glenfiddich@wwtw.org.uk or by calling +44 (0)20 7632 4827. With the help of their bidders, Glenfiddich hopes to break the world record set by the sale of bottle No.1 in order to raise as much money as possible to support Walking With The Wounded’s pioneering work. I would love to taste this… look at that great colour!